I've been mulling over a couple of ideas over the past few months and have spent a lot of time talking at and to people about them. In fact in some ways, my activity over the summer has been insidiously geared towards having discussions about these ideas with different types of people to try and frame them. This, then, is a sort of progress report that starts frayed and ties up towards the end. Partly to write these things down for my own benefit and also to invite response. For the last few months I've been calling myself a critical designer and futurist. Before this I generally framed myself as an artist and designer, this was always something of a cop-out to me and I was aware that over time I'd have to narrow it down. Both critical designer and futurist will attract derision of some sort or another but it's important to have a grounded point from which I can defend it. 'Artist' was dropped after reading some of Dr Matt Malpass' papers on framing critical design in the design world. Participants and faculty of the UrbanIXD summer school were invited to position their practice. I suggested that 'critic' was a vital role that was missed (left). 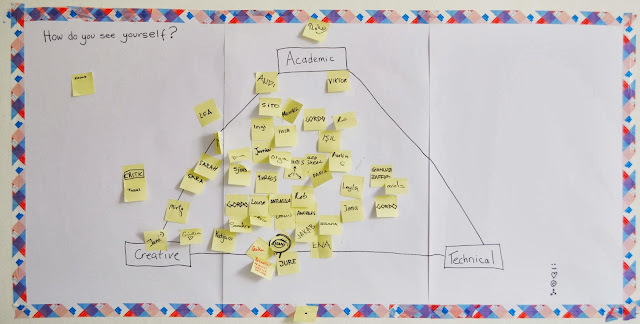 The question of working out whether the critical design approach is actually having impact is something that seems to be becoming more and more common. I've certainly been called up on several times over the summer. We're now at a stage where critical design is in the mainstream media and discussed widely outside of academic and design circles. This may not be a quantifiable metric of success but certainly a strong marker that the aim of the practice to engage the 'public' - in the broadest possible sense - has succeeded. There are wider questions about the measuring of 'success' and what this means; if a discipline targeted at critiquing and redefining the very criteria by which we measure 'success' should in turn, be measured by the same criteria. But the elephant-question-in-the-room isn't 'does it work? ', it's 'So what if it does work?' Once we've issued the provocation and people have their critical questions toolkit - they get it - it's a very rare instance that anything happens with these provocations. How does this practice of provocation introduce change? Critical design is like the Velvet Underground. It doesn't sell a lot of records but it'll inspire a whole generation of amazing bands. At Improving Reality I laid out some brief theories around protest territories. Historically, if you found that your own ideologies ran into conflict with another set of ideologies; that of the state, your community, your religion, then you ran away. Diaspora and exoduses were the ways in which ideological differences were physically enacted on the earth. War, of course, is the other major physical enactment of ideological conflict but really, until the post-industrial era very few wars were ideological in nature. Most wars were fought for the acquisition of part of the zero-sum Earth; resources or territory, people or security. Barring religious conflicts, themselves usually founded in lust for wealth, ideology played a minor role. Then the modern world becomes an ideological conflict itself. Not just the Cold War and the various proxy wars but also the internalisation of conflicting ideologies. With the global hegemony that followed the collapse of the empires and technologically-accelerated territorial conquest by industry in attempt to stave off the terror of the zero-sum world there was nowhere for an exodus to go. Mass securitisation of internal conflict began after the growth of the labour movement and continued up into the kettling tactics of protest we have today. What do I mean by internalisation? Once there was no longer somewhere else to go, or someone else to blame for whatever problems beset your state, ideological conflicts became no longer manifest in exodus and war but in revolution and protest. Naturally, states were terrified. A huge amount of resource was put into internal securitisation across the world to secure the status quo of power and prevent revolution. This power needed a way for the people to feel that they were exercising their right - to vent their frustration - without allowing them to fundamentally change anything. So the state constructed safe spaces for protest. A space with clearly defined limits of what is and what is not acceptable, a safe space that's structured and controlled. Look at the indenti-kit protest march above. It would have been organised online, where someone would have been making advertising revenue and money from hosting material. It would have been planned at the guidance of police and civil authorities. Even the identical banners talk of a flatpack protest. I don't want to undermine the power that popular protest has, or as I did accidentally at Improving Reality, to undermine the basis of the Occupy movement. They're important and highly visceral ways of exercising desire for change. My criticism is that they're fighting with the weapons of the last war. The thing we have to consider is who and what we are protesting against. I won't regurgitate the stacktivism or infrastructure fictions ideas. Chances are, that if you're here, you know them already but there's a general idea that the very shape of global geopolitics has changed in the last 20 years or so and the people in charge are not who we thought they were. To re-word a great Dylan Moran gag: While we were talking, Google very, very gradually built a future around us. (Please replace Google with whatever or whoever you like to satisfy your own biases.) The point stands that the entities constructing and steering our futures, or what they often like to call the future - with all the baggage of powerlessness and inevitability that that wording brings - aren't states, and they work on a completely different geopolitical strata: There is no town square for Google. When Edward Snowden leaked the details of the PRISM program to the world press, he wasn't revealing anything. We already knew, at some very fundamental level that a vast apparatus existed to observe and harvest us and our 'data'. Whether through decades of dystopic training or the simple maths of adding ruthless western capitalism and it's history of paranoia to enabling technology we knew that these things were happening. I wrote some time ago about the fact that the rebalance of power enacted by the PRISM revelations is different to what is easily read - they forced us to react. Snowden issued a call for action, and the world failed to respond. I now have a term for this retreating reaction - shocked acquiescence. When faced with something so large and unfathomable as PRISM or climate change, the most common reaction is to accept or pretend it's not happening and move on. So why this response? 'There's no town square for Google' wasn't just a tweetable bite. We have no space in which we can protest, in which we can occupy and configure a conflict besides or in front of the thing we wish to protest and air our grievances against. For both the new geopolitics and the threat of climate change, there is no common language, no common space, no commons. The Athens Wireless Metropolitan Network is something I bring up a lot as an example of 'technology as a territory.' If what we're lacking is a territory for protest, for conflict or for change, then the Athens network is at least a glimpse of how we might create one. It's a mesh network of around 2500 peer-to-peer nodes built as an alternative to the Internet in Greece. It was built partly in response to the poor quality of the connections in Athens, partly after government shutdowns at the height of the protests and is now quickly picking up users after the NSA revelations. What we have here is not the drive to move into alternate territory - to buy a different product, to boycott a service - but to actually build a new one based on entirely different foundational principles. From Philip Ronnenberg's Post-Cyberwar series, the Social Teletext Network proposes an alternate form of Internet-like communication in a post-technology world. Can the next iteration of critical (or other forms of) design be used to create platforms or territories for ideological conflicts to occur? To me this seems to be the 'then what' after the 'what if?' We don't want to be in a position where we become solutions peddlars, but it's important to move beyond provocation and into how this young but established toolkit can potentially be used to enact real change. The form that these platforms or territories might take is unknown to me as yet. I also make assumptions in this question that are up for debate: I assume that state and legal frameworks are now incapable or not inclined to deliver change that people want. I assume that capitalism (the best-worst idea) has failed and that there is a general consensus that the current status quo is intolerable. I also assume that we as humans don't want to make other humans suffer and yet conflict is the most powerful agent of change - therefore it is desirable to maintain conflict without hurting people. I'm also wary of just accelerating fear, whether over surveillance or climate change, or whatever crisis might face us. I believe that it's not enough to wait for x to happen then respond - that the reality of making decisions that will form futures requires the gravity and visceral nature of that crisis to be accelerated forward (or backward) into the present in order that it can be 'played' with or turned over by the various conflicted parties. However this might invite superfluous conflict just because they can happen in this 'safe space' that is the designed conflict territory. Yosuke Ushigome's Commodotised Warfare proposes a series of vehicles used to host sporting or cultural spectacles as a way to focus ideological conflicts. This is a good place to stop. There are other frayed edges to this thinking that need to be better formulated and discussed. There are things coming up in the next year which will give me some space to play with these ideas outside of my own head or conversations and I'll try and issue some updates as conversations and things evolve.